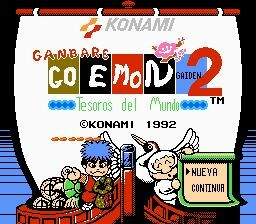 This is a full Spanish relocalization for the game Ganbare Goemon Gaiden 2 Tenka no Zaihou, based on the awesome work by the very fitting name group Adventurous Translations as hacking a game like this one is an adventure in itself. The vast majority of the text and graphics in the game have been localized and Spanish punctuations symbols where added. Due to how the game internally works, some compromises had to be made to fit all the text in the rom, mainly minor spacing issues and very few typos that would be difficult to correct, this is elaborated in the readme file.